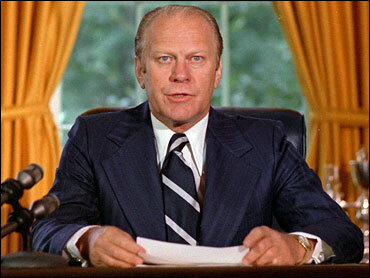 On a September Sunday in 1974, President Ford told the nation it was time to "shut and seal this book" of Watergate by pardoning his predecessor, Richard Nixon. Ford's stunning announcement may also have sealed his political fate, since the nation's only president never elected to nationwide office — a Republican — lost the 1976 election to Democrat Jimmy Carter. Many said the unpopular pardon was a cause of Ford's defeat. But years later, Ford's act of conscience was viewed differently. In 2001, Ford, who died Tuesday, received the John F. Kennedy Profile in Courage Award named after the former Democratic president. He was chosen by a bipartisan committee of political and community leaders, who had the luxury of looking back at the fateful day of Sept. 8, 1974. Ford was not known for his eloquence, but he was eloquent when he addressed the nation that day in the Oval Office. He said his was a solitary decision. "There are no historic or legal precedents to which I can turn in this matter, none that precisely fit the circumstances of a private citizen who has resigned the presidency of the United States," he said. The accusations of Nixon's Watergate misdeeds "hang like a sword over our former president's head, threatening his health," Ford said. But his primary concern was for the nation. "My conscience tells me clearly and certainly that I cannot prolong the bad dreams that continue to reopen a chapter that is closed," he said. "My conscience tells me that only I, as president, have the constitutional power to firmly shut and seal this book. "My conscience tells me it is my duty, not merely to proclaim domestic tranquility but to use every means that I have to insure it." CBS News chief Washington correspondent Bob Schieffer told AP Radio News in 2003 that he asked Ford if he felt Nixon should have thanked him, and Ford replied, "It would've helped." Schieffer pressed Ford and asked how he felt about Nixon not thanking him, and Ford chuckled and said, "Well, that's Nixon for you." Schieffer said Ford believed that the pardon was "the major factor" in his later losing the presidential race to Carter. Ford revisited the pardon during an exclusive interview in 1984 with CBS News correspondent Phil Jones. "The political fallout was far more serious than I contemplated," Ford told Jones. "I knew it would have a downside politically, but I had to weigh the political ramification, which was obviously negative, with the benefit to the country, which was very significantly on the upside. And that's part of your job in the White House." Watch Phil Jones' Interview With Gerald Ford In 1984. Ford's interview with Jones, who covered the White House from 1974 to 1977 for CBS News, was conducted under the condition that it would not air until Ford died. Asked if his pardon of Nixon was part of a deal he made with Nixon in order to become vice president, Ford vehemently denied the allegation. "It's pure speculation and total demagoguery because under no circumstances was there any discussion between myself and President Nixon in regards to that," Ford said. Appearing on CBS' The Early Show, Ford's former Chief of Staff Alexander Haig also denied a deal was made for Nixon's pardon. "The president (Ford) was alone when he pardoned the president (Nixon). His staff was, to the man, against it," Haig said. "I simply was not convinced that the country wanted to see an ex-president behind bars," he wrote in his autobiography. "We are not a vengeful people; forgiveness is one of the roots of the American tradition. And Nixon, in my opinion, had already suffered enormously." And, Ford said, so had the nation. "It was the state of the country's health at home and around the world that worried me," he said. Nixon had not been indicted but stood accused of serious crimes that would take time — perhaps years — to sort out. A grand jury had voted 19-0 to name him an unindicted coconspirator in the cover-up of White House involvement in the 1972 break-in at Democratic headquarters in the Watergate office building. Ford knew the pardon could damage his election chances. "I'm aware of that," Ford recalled, snapping at a cautious aide. "It could easily cost me the next election, if I run again. But damn it, I don't need the polls to tell me whether I'm right or wrong." Nixon held up the process when he balked at Ford's request for a public statement of contrition. The final draft of Nixon's statement bore no acknowledgment of guilt. "That the way I tried to deal with Watergate was the wrong way is a burden I shall bear for every day of the life that is left to me," Nixon wrote. Before taking the statement back to Washington, Ford's aides asked to see Nixon. Shuttered in his San Clemente, Calif., offices, Nixon was gaunt, shrunken and unresponsive. His handshake was weak, Ford's aides reported. "His attention span was short," Ford wrote. "What few remarks he made were left incomplete, in mid-sentence." "I was taking one hell of a risk, and he didn't seem to be responsive at all," Ford wrote. Still, he accepted the statement and made his way to the Oval Office. Ford turned to face the cameras and the nation. "Finally, it was done," Ford wrote in his book. "It was an unbelievable lifting of a burden from my shoulders. I felt very certain that I had made the right decision, and I was confident that I could now proceed without being harassed by Nixon or his problems anymore."